Please read this Terms of Service agreement before accessing our website. This Agreement sets out the standards of use of the Stop Stressing Out and Zohar Adner Online Service for Registered Members and Unregistered Visitors. By using the Stop Stressing Out and the www.stopstressingout.com website, you (the "Member" or "Visitor") agree to these terms and conditions. If you do not agree, you should not use this website. We have the right to modify, alter, or update this agreement without prior notice. Changes will be effective immediately upon being posted at www.stopstressingout.com. Use of the Service after amendments are posted constitutes your acknowledgement and acceptance of Agreement and its modifications. Except as provided in this paragraph, this Agreement may not be amended. 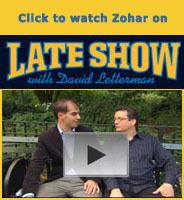 Stop Stressing Out and Zohar Adner is providing Members and Visitors with information and resources at www.stopstressingout.com. Member or Visitor must provide all equipment necessary for their own Internet connection, including computer and modem, provide for access to the Internet, and pay any related fees. Members and Visitors agree to indemnify and hold Stop Stressing Out and Zohar Adner, its website hosting company, its parents, subsidiaries, affiliates, officers and employees, harmless from any claim or demand, including reasonable attorneys' fees and costs, made by any third party due to or arising out of use of the Service, the violation of this Agreement, or infringement by Member or Visitor, of any intellectual property or any other right of any person or entity. Membership may be required for certain transactions on this website. Those choosing to register on www.stopstressingout.com will get a password and an account to become Members. Members are entirely responsible for any and all activities which occur under their account whether authorized or not. Member agrees to notify Stop Stressing Out and Zohar Adner of any unauthorized use of Member's account or any other breach of security known or should be known to the Member. Member's right to use the Service is personal to the Member. Member agrees not to resell or make any commercial use of the Service without the express written consent of Stop Stressing Out and Zohar Adner. The site is provided by Stop Stressing Out and Zohar Adner on an "as is" and "as available" basis. Stop Stressing Out and Zohar Adner makes no representations or warranties of any kind, express or implied, regarding the use or the results of this web site in terms of its correctness, accuracy, reliability, or otherwise. Stop Stressing Out and Zohar Adner has no liability for any interruptions in the use of this Website. Stop Stressing Out and Zohar Adner disclaims all warranties with regard to the information provided, including implied warranties of merchantability and fitness for a particular purpose, and non-infringement. Stop Stressing Out and Zohar Adner is not liable for any damages whatsoever, and in particular Stop Stressing Out and Zohar Adner shall not be liable for any special, indirect, consequential, or incidental damages, or damages for lost profits, loss of revenue, or loss of use, arising out of or related to this web site or the information contained in it, whether such damages arise in contract, negligence, tort, under statute, in equity, at law, or otherwise, even if Stop Stressing Out and Zohar Adner has been advised of the possibility of such damages. Stop Stressing Out and Zohar Adner reserves the right to modify or discontinue the Service. Stop Stressing Out and Zohar Adner shall not be liable should Stop Stressing Out and Zohar Adner exercise its right to modify or discontinue the Service. Visitors and members acknowledge and accept that Stop Stressing Out and Zohar Adner does not guarantee continuous, uninterrupted or secure access to our website and operation of our website may be interfered with or affected by factors or circumstances outside of our control. Member and visitor both assume all knowledge of applicable law and are responsible for compliance with any such laws. Our service may not be used in any way that violates applicable state, federal, or international laws, regulations or other government requirements. Member and visitor further agree not to transmit any material that encourages conduct that could constitute a criminal offense, give rise to civil liability or otherwise violate any applicable local, state, national, or international law or regulation. Stop Stressing Out and Zohar Adner is committed to protecting your privacy. This spells out our current privacy practices with regard to the information we collect when you interact with our website. By accessing www.stopstressingout.com you acknowledge and understand this Privacy Statement and consent to the information collection and use practices described here. Stop Stressing Out and Zohar Adner collects certain information from and about its users three ways: from our host's Web Server logs, the user, and with Cookies. Web Server Logs. : When you visit our Website, we may track information to administer the site and analyze its usage. Examples include: Day & time you visited, your IP address, your Internet Service Provider, the state or country from which you accessed us, the type of browser or computer you use, how many links you click within the site, Web page you came from and the pages you viewed. Stop Stressing Out and Zohar Adner reserves the right to share aggregated site statistics with partner companies, but does not allow other companies to place cookies on our website. User's Personal Information: Visitors to our website may be able to register to attend events, make a purchase or download information. When you register, you will provide personal information such as name, address, email, telephone number or facsimile number and other relevant information. If you are making a purchase, we will request financial information. Any financial information we collect is used only to bill you for your purchase. This information may be forwarded to your credit card provider. We will not disclose personally identifiable information we collect from you to third parties without your permission except to the extent necessary including: To fulfill your requests, to protect ourselves from liability, in response to a legal process or if our company changes hands. We will provide you with the means to ensure that personally identifiable information in your web account file is correct and current. You may review this information by contacting us by sending an email to us at info@stopstressingout.com. Related services and offerings linked to from this website have their own privacy statements that can be viewed by clicking on the corresponding links within each respective website. Since we do not have control over the policies or practices of participating merchants and other third parties, we are not responsible for the privacy practices or contents of those sites. We recommend you review their policies before you provide any personal information or complete any transaction with them. We will use reasonable efforts to promptly respond and resolve any problem or question. Stop Stressing Out and Zohar Adner may occasionally update this privacy statement. When we do, we will also revise the "updated" date at the top of this Privacy page. You should periodically review this privacy statement to stay informed about how we are protecting the personal information we collect. Your continued use of the service constitutes your agreement to this privacy statement and any updates. www.stopstressingout.com may host and enable online transactions from two different sources: Directly from Stop Stressing Out and Zohar Adner and through third party merchants and affiliate programs. The policies below differentiate between these two types of transactions. Events: Event registration for workshops, classes and other events may be transacted from time to time on www.stopstressingout.com. Event registration fees are not refundable, but are transferable to a future event within a one-year time frame. Contact Stop Stressing Out and Zohar Adner via email at info@stopstressingout.com or phone 805-217-4881 for specific requests and inquiries. Products: When Stop Stressing Out and Zohar Adner sells products directly from the Store section of www.stopstressingout.com, refunds will be handled as follows: If you are dissatisfied with any product you purchased from us, you may request a refund in writing. Your purchase price will be refunded minus the cost of shipping and handling, if any. For more information on our product warranty, please see our Warranty Policy. Downloads: Downloads of documents or materials from www.stopstressingout.com are not refundable. Other Services: Other sales through our website will be subject to refund policies as posted with the purchasing information. Within the store on www.stopstressingout.com, some items for sale may link to third parties. (for instance Amazon.com). Stop Stressing Out and Zohar Adner simply provides the link to this site and the transaction is completed and fulfilled through this third party. Your purchase is wholly subject to the policies and conditions posted on this third party site. If you have questions regarding this Refund Policy, please send an email to info@stopstressingout.com or send via US Mail to: Stop Stressing Out c/o Zohar Adner, 339 East 12th St, Suite 2, New York, NY 10003. Stop Stressing Out and Zohar Adner may occasionally update this policy. When we do, we will also revise the "updated" date at the top of this page. Your purchases will remain subject to the most recent version of this policy. Directly from Stop Stressing Out and Zohar Adner or from an affiliate relationship with a third-party online retailer. The policies below differentiate between these two types of transactions. Products sold directly by Stop Stressing Out and Zohar Adner are satisfaction guaranteed. If for any reason you are not happy with a purchase you have made from www.stopstressingout.com, please contact us immediately at info@stopstressingout.com to make specific arrangements. If a defective product has been delivered, we will replace it at no charge. If you are returning a product for some other reason, you will receive a credit minus the cost of shipping, if any. Stop Stressing Out and Zohar Adner makes no warranties or representations whatsoever with regard to any product provided or offered by any Vendor, and you acknowledge that any reliance on representations and warranties provided by any Vendor shall be at your own risk. You will also be subject to refund policies posted by these Vendors. If you have questions regarding this Refund Policy, please send an email to info@stopstressingout.com.